Is it true, only know you love when you let 'er go? So is it true, though, you only really know you love her when you let her go? I love the audience expressions! He crushed that performance! Artist is "Passenger"
There is a Neil Diamond song, Forever in Blue Jeans. I always thought he was singing, "For Reverend Blue Jeans!" I thought the same! lol. What do/did you like the most about your current/last partner/crush? Should people with extreme insecurities and self-esteem issues stay single forever so they don't hurt the person in a potential relationship? Have you found your soulmate yet? If somebody you didn't like asked you out, how would you react? I'm a 29-year-old virgin - how big of an issue is that? No, I dont think that's true. 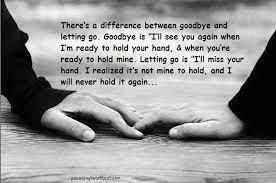 Home > Relationships > Is it true, only know you love when you let 'er go?